For more information, you may refer to this introduction in the SAP community or to the official documentation for SAP HANA Cloud Platform, OData provisioning . See here for a nice comparison. In the present blog, we’re going to have a closer look into performance statistics. In SAP HANA Cloud Platform (HCP), the OData provisioning is enabled and exposes an OData service. The OData service is used to provide data residing in an SAP backend like SAP Business Suite. As required for OData exposure, the backend implements a SAP Gateway service. 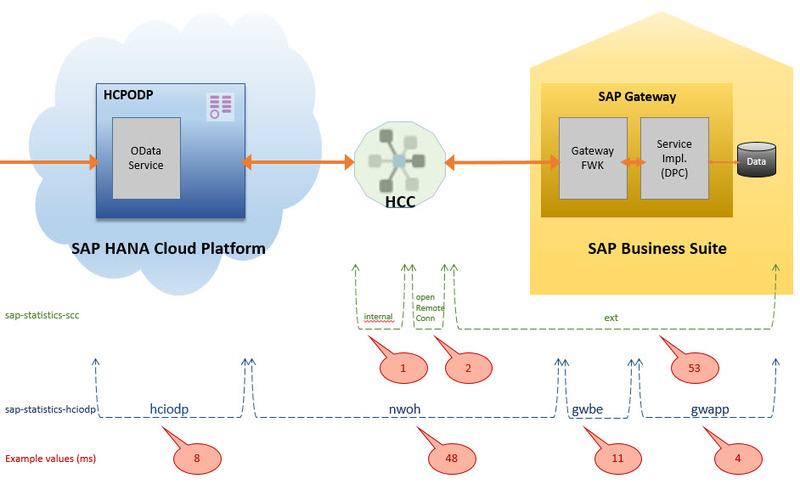 In order to connect the cloud with the backend, a SAP HANA Cloud Connector (HCC) is used . The OData service can be consumed by a Fiori application in the cloud, in our example we’re using a browser or REST client. When executing an HTTP request to an OData service, you might be interested in analyzing the performance of the service call. A quick and easy step in this direction is to have a look at the SAP performance statistics which can be obtained for each service call. See the Appendix section below for alternatives. The performance statistics are then returned in the response of the service call. They are returned as header. There are 2 headers in the response and each header has several metrics passed as values. The first one is meant for the HCP OData provisioning, the second one for the SAP HANA Cloud Connector. Please refer to the Appendix section below for instructions on how to access the performance statistics. Before we go through each of the metrics, I’d like to introduce a little diagram which attempts to visualize the flow in a simplified manner. It shows the involved components and the communication between them. The horizontal lines in the bottom indicate how to correlate each metric to the corresponding component, like a timeline. In the following sections we’re going to describe each of the returned metrics. The example values of the descriptions are based on the screenshot above. These statistics are contained in the value of the header sap-statistics-hciodp in the response of your odata service call. In the following sections, we’ll have a closer look. This metric provides the time that is spent in the cloud for exposing the backend data as OData service. With other words, the time that is consumed by the OData provisioning service in HCP. OData provisioning is a piece of software running in HCP, which exposes the backend data as OData service. It analyzes the incoming OData request, retrieves the requested data from the backend and exposes the received data as OData response. The time consumed inside OData provisioning is provided in the hciodp metric. This means that the metric doesn’t contain the time during which the OData provisioning is “waiting” for the data to be returned from the backend. After the OData provisioning has sent a request to the backend, some time is spent on the network. This duration is captured in the following metric. Network overhead. This figure identifies the time which is lost on the network. The OData provisioning talks to the backend and all the time that is lost in between, is specified in the nwoh metrics. 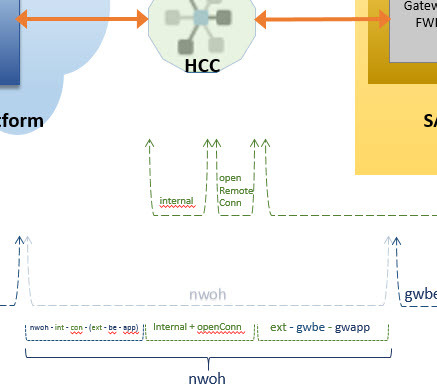 There might still remain an open question: usually, there’s a SAP HANA Cloud Connector (HCC) between the cloud and the backend. The answer is that the HCC in mid of the communication counts towards the communication, means it is part of the nwoh figure. This parameter describes the time it takes for processing the request in the SAP Gateway framework in the backend. The OData provisioning talks to the SAP Gateway component in the backend which processes the request and asks the data provider class for the data. and the data provider class which is implemented by the Gateway service developer and which has the knowledge about which data has to be delivered and how. The OData provisioning in HCP exposes backend-data as OData service. When talking about “backend-data”, we aren’t referring to arbitrary raw data. OData provisioning requires the SAP Gateway component in the backend. At the end of the day, the ABAP developer implements a so-called data provider class, which has the task to provide the raw data as expected by the Gateway framework. 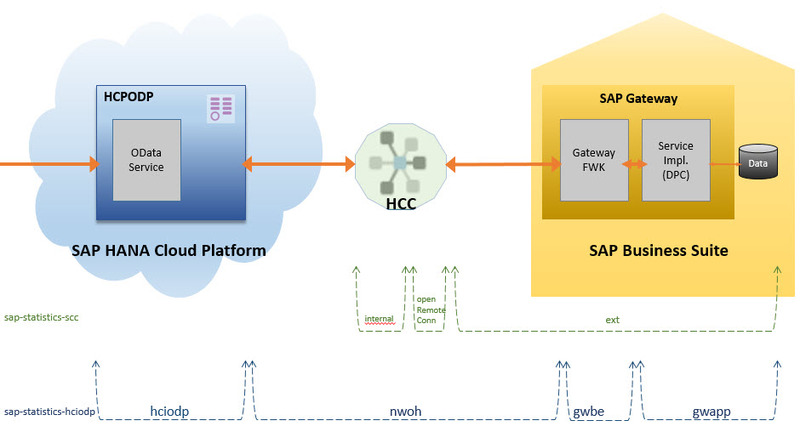 The SAP Gateway framework is contained in the IWBEP component in the SAP backend. The implementation of the data provider class is responsible for fetching and providing the data that is afterwards handed over to the framework(s). In that regard, the gwapp metric might be very interesting when analyzing the performance statistics. This figure is intended to allow to separate the time spent in the framework(s) from the time consumed by developer implementation and other components. Also referred to as gwtotal. This means, the number simply sums all existing values and ignores whether they are spent in the framework, by developer or lost in the network. These statistics are provided by the SAP Gateway backend, like gwbe and gwapp, and they are explained here. The diagram below shows the example values in the timeline. These statistics are contained in the value of the header sap-statistics-scc in the response of your OData service call. As the name indicates, this parameter informs about the time used for opening a connection to the configured backend. The job which has to be done by the cloud connector is to forward the incoming request to the connected backend. The cloud connector itself doesn’t do much and thus doesn’t waste much time. The time spent inside the cloud connector is not provided in the header value. But the time that is spent after the request leaves the cloud connector, which is much bigger, is specified in the metrics ext. The duration which is measured is all the time spent in the backend and in the communication between HCC and backend. The total figure sums all the cloud connector statistics. The reason is that a number is missing, which counts to the total duration. This number (“Internal”) can be viewed in the HCC itself. It is the duration which the cloud connector itself needs internally to process the request. Usually a very small number. Please refer to the Appendix for an explanation about how to find the performance view in the HCC. So now let’s find out how to find the missing number to get our calculation correct. Open the HCC and go to the performance monitor view. Apart from other details, you can see the performance numbers in a horizontal chart. The numbers should be identical with those that are given in the response header of the OData request. We can compare the Duration, Open Connection and External (Back-end) (from the screenshot above) to the metrics in the response of our OData requests, the total and openRemoteConn and ext. So finally, at the end of the day, our calculation is correct. The below diagram tries to visualize our findings. It tries to visualize how the different metrics fit together and how the nwoh correlates to the other metrics. The example values are based on a configuration using Basic Authentication. In case of more sophisticated authentication settings, the figures in HCC would look a bit different. So far, all has been pure theory – abbreviations, numbers, descriptions… all boring. It’s time to get our fingers dirty and try out a couple of examples. The framework in the cloud takes around 40 ms and the service implementation in the backend needs 5 ms to provide all sales orders. As expected, this call takes much more time (1198 ms). The service implementation in the backend needs 980 ms, which is much more than the 5 ms of the previous example. We would check the statistics and see that all involved components are acceptable (41 ms, 100 ms), even the network doesn’t take too long (71 ms). And we would easily identify that it is the service which consumes most of the time and might be not properly implemented (980 ms) in the backend and the performance issue could be solved there. The service call returns the list of registered services, which are persisted and maintained in the cloud, so no call to the backend is required. Accordingly, the screenshot below shows that the Cloud Connector time consumption is 0. All figures that are sent by the backend, like gwbe, gwapp, are empty. This example can only be followed if there’s a so-called “standalone annotation model” available in the backend. Here you can find a tutorial about how to create an annotation model. Such URL requires a call to the backend for retrieving the annotation model, which is implemented and registered in SAP Gateway in the backend. However, there’s no service implementation done by the developer. More concrete: there’s no data provider implementation, only annotation provider which is not time-consuming. Therefore, no gwapp value is returned for this call. However, the SAP Gateway framework delivers the information about the annotation model, that’s why the value for gwbe (6 ms) is available. And also the involved Cloud Connector takes a little time, since the call goes to the backend. The previous examples were recorded with enabled metadata cache. Now let’s see how it looks like when the cache is disabled. BTW, if you aren’t familiar with it, you may refer to the Appendix section. So first let’s disable the metadata cache. This means, that for every OData service call, the OData provisioning has to first execute a call to the backend to fetch the metadata document. Only after that call, the actual user request is executed. These additionla calls are done internally and user won’t notice. Usually, the metadata of a service don’t chance once the service is developed and ready. But in case the metadata do change (in the backend), then the admin has to clear the cache (in the cloud), such that the metadata can be fetched in its new version from the backend. Furthermore, the OData provisioning helps to deal with such issues by performing a so-called “metadata handshake”. This means that is checks if the cached metadata are equal to the backend-metadata and informs in case that they aren’t equal. So after the cache is disabled, we execute the request to the sales orders again (like in example 1) and check the statistics. As a result, we can see that the total duration is much higher (506 ms compared to 123 ms in example 1). However, the duration of the data provider (5 ms) has not changed at all, which is expected. It is worth the time to have a closer look to understand the reason of the difference. The result is exactly the value that we have in the sap-statistics-scc in the screenshot above. The same calculation can be done with the other values. In brief: the numbers that we – as users of the OData service – get from the statistics headers is the sum of the 3 calls that OData provisioning executes towards the backend. Yes, WE fire only ONE call to the OData service, but the framework internally fires 3 calls to the backend. One is for fetching the metadata document, another one is for the texts and finally the one that fetches the requested data. So this last example has clearly shown that using the metadata cache improves the performance. Like a query string, it has to be separated from the service URI with a ? The statistics are returned in a header value. Headers cannot be viewed in a browser window, but if your browser contains developer tools (like Chrome, Firefox, Internet Explorer etc), you can view that information there. The toolset is usually opened in the bottom of the browser. Then fire the request again. Click on the request to view the details. Install a REST client of your choice, e.g. “Postman”. In the request section, enter your cloud user credentials, enter the sap-statistics request header and fire the request. When analyzing performance of OData requests, it might be worth having a closer look at the Administration Frontend of the SAP HANA Cloud Connector. The HCC frontend can be reached at port 8443. On the left pane, select the desired account from the drop-down box. Note that otherwise you would be monitoring the wrong requests! Now select “Most Recent Requests” from the left navigation pane. On the right pane, select your desired backend system from the drop-down box. The below list gets populated with the most recent requests. Click into the first line. The “Request Details” section gets visible below. Great post. 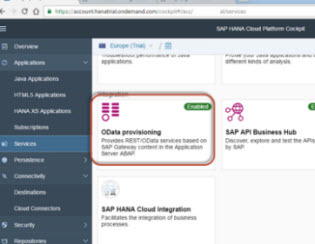 Can you comment on the relation between the statistics that you can get through odata provisioning the way you describe here the analytics tools that are provided through SAP HANA Cloud Platform API Management? Thanks so much for your feedback ! 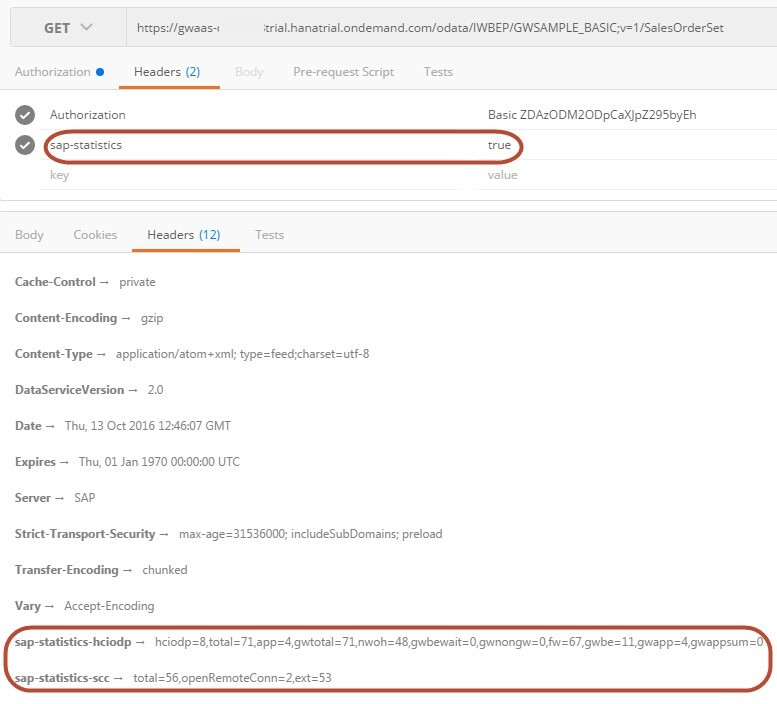 In API management, you connect to an SAP backend and expose SAP Gateway services as an API proxy. Then you call this API proxy and you might be interested in analyzing the performance of the call, which goes through the API mgmt to the backend. One aspect is the time that is spent in the API mgmt itself. And the other aspect is the full time of a call to the API proxy. The API mgmt. has a debugger tool which provides very detailed view on the full roundtrip of the API call, which allows to check if any configured policy, etc needs to much time. However, it focuses on the API mgmt. It doesn’t provide more details once the call leaves the API mgmt., such as network, cloud connector, gw-fwk etc. We should turn to Holger Bruchelt, API managementexpert expert, to give some further insights. there is not much too add to Carlos explanation. 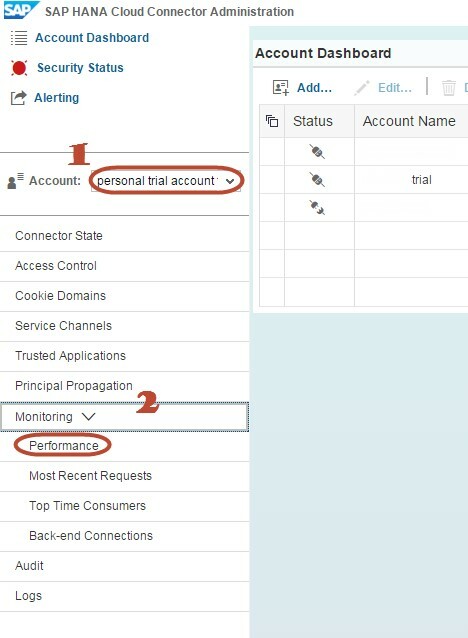 The analytics features of SAP HCP, API management can provide a performance overview of the actuall steps that are being executed within the API proxy. You could leverage all the features outlined by Carlos on top. In addition to that API management provides you with detailed analytics features on the usage of the different API proxies. How often were they called? By which application? Developed by whome? So the combination of both could be a great asset depending on the scenario and the insights that you are interested in. Yes, thanks Carlos. A great feature but your careful explanation of how to interpret the results is definitely required. thanks for the feedback. And yes, you’re absolutely right to use $select whenever possible. And other considerations could be related to the nwoh, like e.g. using json instead of xml reduces the load to be sent on the network. In my tests sap-statistics-scc allways returns 0 , even with an on-premise backend connected trough CC. Is there some config to do ?